Imagine this — a 150,000-square-foot abandoned factory transformed into an ultramodern world where design, innovation and technology are the solutions to today’s grand challenges. Welcome to the Festival of the Future. From September 28 to October 8 2017, step inside a world where crickets can combat global hunger, medical supplies are 3D-printed in outer space, drones deliver blood to remote communities, and shipping containers are the future of farming. Discover projects that make a difference. A Design Exchange production, in partnership with the United Nations Development Programme (UNDP), this 360° experience presents an “edit” of the undertakings and projects that are making the world a better place, for all people. Learn how to design the future. Through an array of participatory experiences, talks, installations, and workshops, discover how you, too, can design the future. Come see Mickey Mouse's Home of the Future! 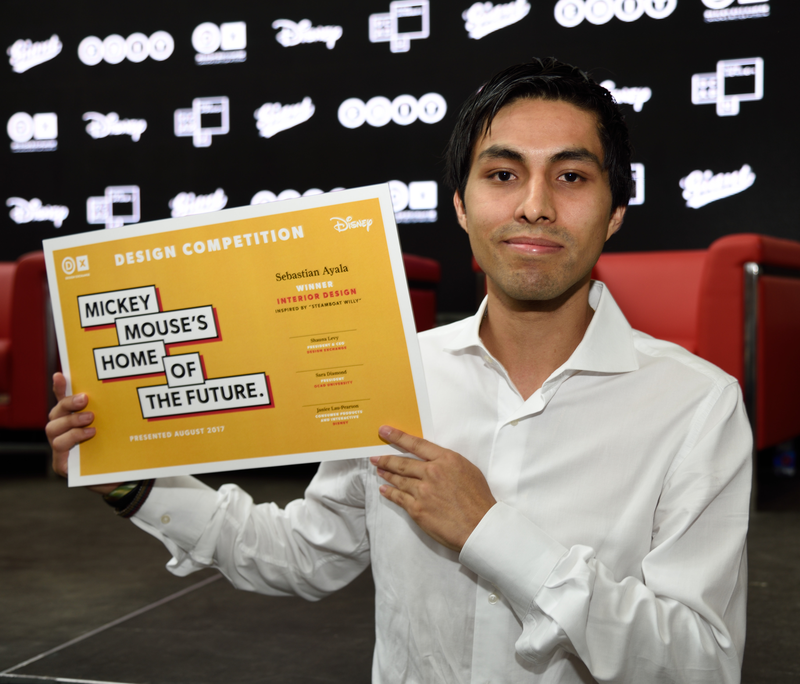 This summer OCAD U students had the chance to collaborate with Disney and EDIT in a design competition for Mickey Mouse's Home of the Future, which envisions a not-so-distant future that focuses on a contemporary and sustainable way of living. Students were asked to consider sustainable solutions for interior and industrial design while communicating Mickey Mouse's personality. The competition included two sectors: interior design and industrial design. The interior design challenge called on participants to create a living room, kitchen and bedroom from existing sustainable products, using a 640 ft. shipping container from Giant Containers. The industrial design component focused on the design of a brand-new interior product, based on the principles of sustainability and Disney Creative. Come see Mickey's Murphy bed, designed by Rachel McCormick and Aira Harutyunyan (Industrial Design sector) and Sebastian Ayala's Interior Design sector winning entry inspired by Steamboat Willy! Mickey Mouse's Home of the Future is presented by Design Exchange in partnership with Mickey Mouse and the Walt Disney Company of Canada, and produced by Giant Containers. Partners: OCAD University and Giant Containers. This summer, OCAD University students were invited to reimagine the home of Mickey Mouse. Mickey Mouse's Home of the Future envisions a not-so-distant future that focuses on a contemporary and sustainable way of living. Students were asked to consider sustainable solutions for interior and industrial design while communicating Mickey Mouse's personality. Presented by Design Exchange (DX), in partnership with Mickey Mouse and The Walt Disney Company Canada and produced by Giant Containers, the contest offered students a chance to collaborate with Disney at EDIT: Expo for Design, Innovation & Technology, this fall. Entries were evaluated by the following panel of judges: Shauna Levy (President & CEO, Design Exchange), Dr. Sara Diamond (President and Vice-Chancellor, OCAD University), Jana Macalik (Associate Dean, Faculty of Design,OCAD University), Janice Lau-Pearson (Senior Manager, Franchise, Disney Consumer Products Canada), Daniel Kroft (Vice President, Giant Containers), Gordon Kroft (President & CEO, Giant Containers) and John Tong (Founding Principal and Executive Creative Director, tongtong). The winning submission will be fabricated by Giant Containers and exhibited in Mickey Mouse's Home of the Future at EDIT in Toronto (September 28 to October 8, 2017), a 10-day international design festival that explores how design, innovation and technology can address today's global issues and envision a world where all people prosper.